Tag line: "Belief divides them, mystery surrounds them, but fear changes everything"
When a thunderstorm damages his house, artist David Drayton (Thomas Jane) heads into the nearby town of Bridgton, Maine, for supplies. Joined by his young son Billy (Nathan Gamble) and neighbor Brent Norton (Andre Braugher), Drayton swings by the supermarket, arriving just ahead of a thick mist, which is quickly rolling into the area. Suddenly, a tornado alarm sounds, at which point Dan Miller (Jeffrey DeMunn) rushes into the store. His nose bleeding, Dan tells everyone that there’s something in the mist, which, he claims, carried off one of his friends. As a precaution, supermarket employee Ollie Weeks (Toby Jones) immediately locks the doors, just as the mist envelops the entire store. With dozens of frightened and confused customers wondering what they should do next, Mrs. Carmody (Marcia Gay Harden), the local religious zealot, begins shouting that Armageddon has arrived, and that everyone should make their peace with God before it’s too late. Having left his wife Stephanie (Kelly Collins Lintz) at home, Drayton is anxious to get to her, but will the unknown creatures lurking in the mist allow him to leave, or is it truly, as Mrs. Carmody believes, the end of days? 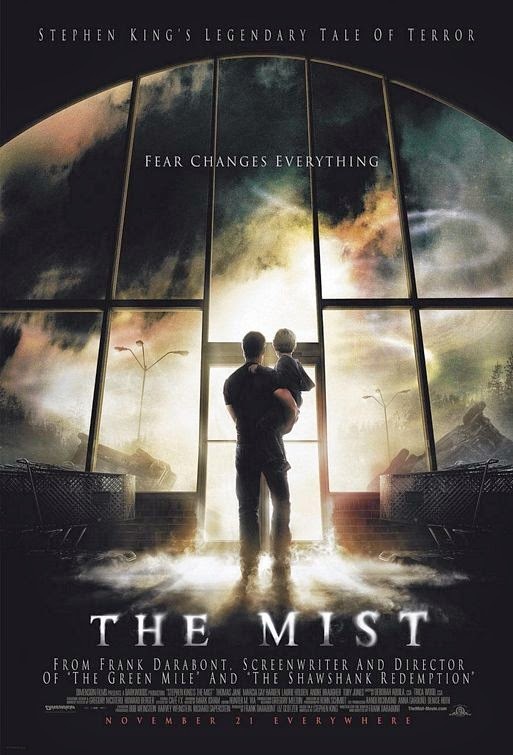 Based on a novel by Stephen King and directed by Frank Darabont (who also helmed two other King adaptations, The Shawshank Redemption and The Green Mile), The Mist is an intense horror film that, at the outset, plays on our fears of the unknown. At first, the thick, fog-like mist offers up no clues, leaving some to wonder if the danger is real, or a figment of Dan Miller’s imagination. That question is answered when Drayton notices the entire back room is filling up with fumes, which seem to be coming from the generator. Joined by Ollie Weeks and several others, including Norm (Chris Owen), the store’s bag boy, they determine that something is clogging the generator’s exhaust vent. Ignoring Drayton’s protests, the group sends Norm outside to clear the blockage. Alas, poor Norm doesn’t get far; shortly after venturing outside, he’s grabbed by a huge, octopus-like tentacle, which proceeds to drag him off. It’s at this point The Mist changes gears, transforming itself into an old-fashioned monster movie, complete with sequences in which the unfortunate few trapped inside the store face off against creatures that, in the end, may be too powerful to defeat. Yet as terrifying as these monsters can be, they sometimes pale in comparison to the fanatical Mrs. Carmody, who, as the situation drags on, convinces people the outside threat is the work of God. As she gains followers, her rhetoric becomes even more "fire and brimstone", and at one point claims that God is demanding a sacrifice of blood. It isn’t long before Drayton and a few others realize its just as dangerous to stay as it is to leave. By placing its characters in such extreme conditions, The Mist shows us how easy it is to erase the fine line that separates order from chaos. All of these dynamics come together brilliantly, working in unison to make The Mist an unsettling experience from start to finish. I'm getting together with some friends for a marathon of scary movies, we've each been asked to find a "hidden gem" and I'm thinking about bringing this one. I've also thought about maybe FRAILTY or even TROLLHUNTER. Dr. Shock, could I bother you for a recommendation? What would you bring as a hidden gem to a scary movie night? Jared: Thanks for the comment! And the "Hidden Gem" scary movies night sounds like a blast! Off the top of my head, I'd recommend a vampire movie called STAKE LAND. It's directed by Jim Mickle, and is a creepy vampire / post-apocalyptic hybrid. Very well done flick! Oh, good call! Thank you very much. This is definitely one of the better King adaptations out there. I love the original novella but it's my opinion that this movie takes it and actually makes it even more effective. Quite a feat indeed. I'm normally a massive practical effects snob and if I recall correctly there's a significant amount of CGI in this but it's an example of one of those movies where the momentum, suspense and human element is done so well that nothing could take me out of the story.